AMM is an evidence based1 quality of life2; enrichment program that has been developed primarily to meet the needs of health care service practitioners working with the senior/elderly population. 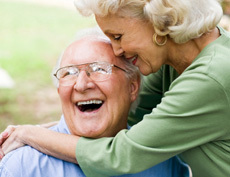 Due to increasing age, the senior population, is at greatest increasing risk for developing dementia symptoms. AMM is designed to be an easy to implement program that offers quality of life benefits for program participants, their families, and caregivers. The AMM program is non-invasive3; it is not a drug or medical device and is completely safe. This means that AMM can always be added to a person’s treatment plan. Unfortunately, Alzheimer's medications don't work for everyone. Some of the most commonly used Alzheimer’s drugs work in less than half the people tested. For those who are helped, the drug's effects often are modest and temporary4. While scientists continue to search for more effective drugs the number of people world-wide diagnosed with Alzheimer’s disease continues to grow to more than 30 million. The term evidence-based practice (EBP) or empirically-supported treatment (EST) refers to preferential use of mental and behavioral health interventions for which systematic empirical research has provided evidence of statistically significant effectiveness as treatments for specific problems. Non-invasive - Not penetrating the body, as by incision or injection: non-invasive surgery; a non-invasive diagnostic method. Source - Mayo Clinic.com - Some of the most commonly used Alzheimer’s drugs work in less than half the people tested. For those who are helped, the drugs' effects often are modest and temporary. Dr. Mira Ashby, CM was the founder of Ashby House, opened in 1978. Ashby House was the first transitional living program for adults with brain injuries in North America. She received the Order of Canada in 1984 for her work on brain injury rehabilitation. She was a doctor in the Red Cross during WWII and spoke more than 8 languages fluently. She died in Toronto on July 16, 2005, she was 84 years old. 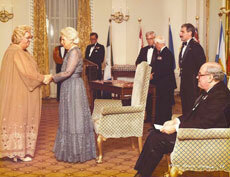 To the left is a picture of Dr. Ashby (on the far left) receiving the Order of Canada from Lt. Governor Jeanne Sauvé taken in 1984. Cognitive Retention Therapy (CRT) now called the Ashby Memory Method (AMM) is a cognitive therapy for dementia based on Dr. Ashby’s original research. AMM is a specifically tailored quality of life enrichment program for persons diagnosed with Alzheimer's disease and other dementia. Combining word exercises, visual stimulation, a process called errorless learning and many other techniques from Dr. Ashby's early research, AMM creates personalized activities based on participant’s interests to stimulate all 5 senses. Information about AMM methodology has been presented at international Alzheimer’s seminars and conferences including the National Conference of the Alzheimer Society of Canada, Toronto and the Alzheimer’s Association’s International Conference on Alzheimer’s Disease (ICAD), Chicago.